Throw the records out the window, because it is rivalry week in Kansas City. On Sunday, the Chiefs will host the Oakland Raiders, and kickoff is set for 3:05 p.m. Earlier this week, Chiefs head coach Romeo Crennel announced that Brady Quinn will get the start for Kansas City. Matt Cassel has recovered from the concussion he suffered against Baltimore, but Crennel feels that starting Quinn is an “impactful move to get everyone’s attention.” Basically, Crennel is looking for anything to spark a Chiefs offense that has not played well this season. Most of that is on Cassel, who has accounted for a ridiculous 14 turnovers this season and has completed only 58% of his passes. The Chiefs will have to rely on Jamaal Charles to move the ball, although that may be a tough task against the Raiders defense, which is only allowing 102 yards per game on the ground. Defensively, the Chiefs have been incredibly inconsistent this season. At times the unit has looked great, and other times it has made bad quarterbacks look like hall-of-famers. Kansas City’s main goal will be stopping Darren McFadden; although McFadden is having a down year, he is capable of breaking a long run at any time. The Chiefs have done a good job against McFadden in the past, and the team’s top priority should be to contain the dynamic back and force Carson Palmer to beat Kansas City through the air. Palmer has thrown for only seven touchdowns this season, and can be prone to turning the ball over. 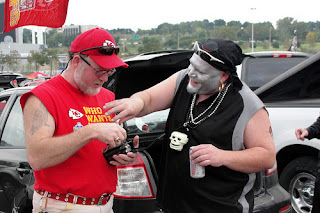 The Raiders are statistically very similar to the Chiefs – Oakland averages 19 points per game and allows 28 points per game, and Kansas City averages 17 points per game and allows 30 points per game. Both teams rely on their running backs for big plays, and that should be the difference on Sunday. If Charles gets going early, Kansas City will have a good chance to pick up its second win this season. If the Chiefs run game is ineffective and Brady Quinn is forced to make a lot of plays, the team will likely be one step closer to a top-five draft pick. It's just a battle of the mediocre at this point. Basically, if our defense can muster up a good game, we would just need the QB and the offense to avoid turning the ball over and/or punts. Who knows, maybe Charles will show up tomorrow for the first time this year. Is it just me or does it seem like he is not quite right?